Since the start of 2013, I’ve been writing My Thoughts On… posts about each and every film I see. I decided that I wanted to write about each film, and in the order that I saw them. I don’t know why I thought putting so much pressure on myself was a good idea; it really doesn’t matter to anyone else if I write these posts or not, but it mattered to me. Now, however, I’ve reached the point where I can’t really maintain this level of commitment! I wish I could write about every film, but the truth is, sometimes I watch a film and don’t really have much to say about it. I’ll enjoy it, but beyond that, there’s often not much more I have to say! So I’ve decided to remove this self-imposed pressure, and not feel obliged to write an individual post about every single film. Instead, I’m going to do a regular roundup of the films I don’t write about. I watched Annie Hall months ago, and I know it’s probably hard to believe that I would find it hard to write about this seminal film! But I did just enjoy it, and although I could have eked out a post about it, it doesn’t feel right to do that. I sometimes find it hard to watch a film that is considered a classic, because it feels as though there is a lot of pressure to enjoy it, and to appreciate why it has become a classic. I enjoyed Annie Hall, but I only laughed out loud a couple of times (mainly when Allen sneezes into the cocaine). it’s beautifully shot, and New York in the seventies is a place I want to visit. Diane Keaton is obviously amazing, and a style icon to boot. The reason I didn’t write about Primer was because I didn’t understand it! It’s a really complex time travel film, and I do think the point is that you aren’t supposed to fully understand it, but it would have made writing a whole post about it rather challenging. The two main characters, Abe and Aaron, create a time machine, and not only is the viewer treated to a lot of techno-talk that will go over most people’s heads, the final act of the film has so many different versions of the characters, and so many different timelines, that it becomes almost impossible to follow. It doesn’t make it unenjoyable, it just leaves you scratching your head and wondering what has just happened. At some point I’d like to watch it again, to see if I can make better sense of it. I watched Network because I thought it was on the AFI 100 Laughs list, and I’m way behind on my attempt to watch ten of those films. After having watched it, I realised that it wasn’t, it was merely shortlisted, and I felt as though I had totally wasted my time, as I didn’t like it at all. It’s another one of those films that is considered a comedy classic, but I can promise you that I didn’t laugh once. It’s not supposed to be straight comedy, it’s a satirical film, and I got the message that the film was trying to put across, but I didn’t find it entertaining or enjoyable at all. 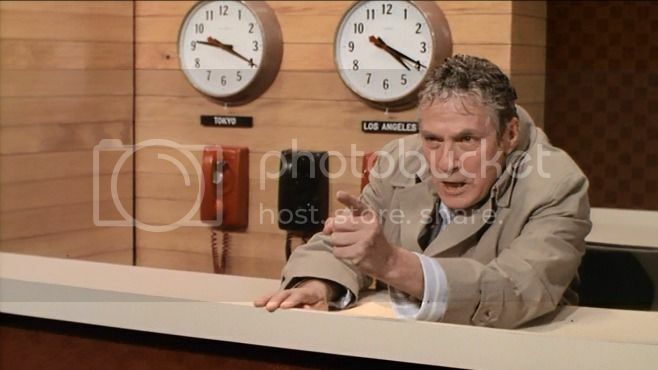 If I’m going to watch a television-based comedy from yesteryear, I’ll pick Broadcast Newsevery time. 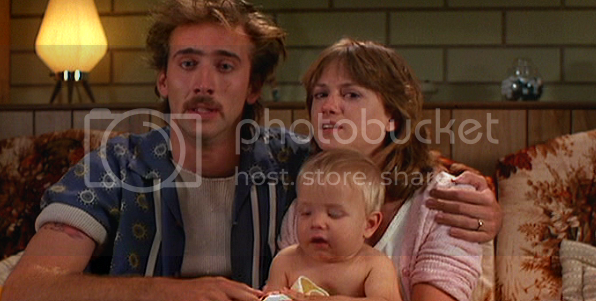 Raising Arizona is a film that actually is on the AFI 100 Laughs list. Would you believe it’s the first Coen Brothers film that I have ever watched? I need to remedy that! I enjoyed it well enough, it was funny in places, and I can totally cope with 80s Nicolas Cage. Holly Hunter is amazing in everything she does, so she’s always good value. I do find though, with these comedy films, that I just don’t laugh as much as I am clearly supposed to. This was another one that was never laugh out loud funny to me. Do I have a tin ear for comedy? I have wanted to see Super 8 since I saw the trailer at the cinema in 2011. That’s not a huge amount of time, but it’s definitely long enough for me to have built it up a fair bit in my mind. I’m a big fan of Kyle Chandler, and I think I could watch Elle Fanning in just about anything, so I was really excited to finally watch this. In the end, I was ever so slightly disappointed. I can’t even really put my finger on what it was, because it’s a perfectly decent film with solid performances, and even has an ELO song on the soundtrack. I guess it just didn’t live up to my expectations, though I loved the mini-film over the end credits. So that’s that, a little roundup of all those films that I don’t want to write full posts on. It keeps my completist nature happy!